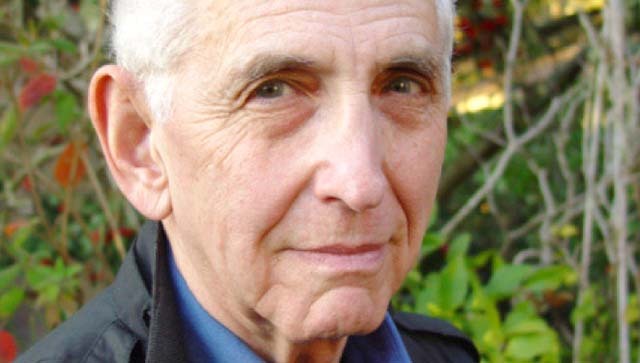 Daniel Ellsberg, the famed leaker of the Pentagon Papers in the early 1970s, is set to speak at San Diego State University next month. For that you might thank a renowned leaker of early 2010. Chelsea Manning — who as Army intelligence analyst Bradley Manning gave WikiLeaks hundreds of thousands of classified or sensitive documents and logs — spoke in April at SDSU. But her talk fell short for Pierre Asselin, SDSU professor of history. So Asselin, a Vietnam War expert who met Ellsberg once at a conference, discussed the idea with his friend Larry Berman, author of several books on Vietnam. And over the summer — “over beer, again, plus sushi this time” — Berman told Asselin that he happened to know “Dan” quite well and would be happy to contact him about an SDSU visit. 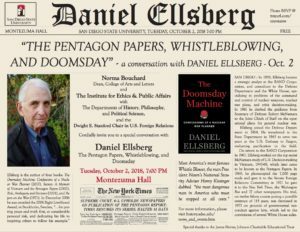 Announced early this week, Ellsberg’s visit Oct. 2 at Montezuma Hall is free but requires registration. A college spokeswoman said Friday morning that 1,102 had registered. The hall’s standing room capacity is 1,120. 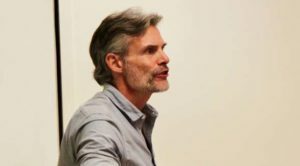 Asselin, the school’s Dwight E. Stanford Chair in U.S. Foreign Relations, said he exchanged some ideas with Ellsberg when he met him in Texas years ago. They stayed in touch for a short while. The leaker of the government’s top-secret history of the Vietnam War will speak for about one hour, Asselin said, followed by questions and answers for about an hour.